On Sunday, May 20, 2018, Global Poker tournament players were eagerly looking forward to jumping into the Main Events of the Rattlesnake Open, a series that had been running since April 30. These Main Events were priced at $22, $110, and $218 to cater to customers with different bankroll levels. Unfortunately, technical difficulties rendered all three events unplayable, and they were canceled to the chagrin of users. In the hours leading up to these three Main Event MTTs, users started reporting glitches and errors. 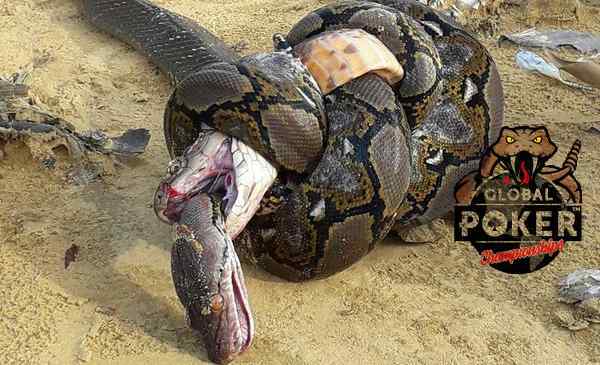 This followed a similar scenario the previous day when one of the Rattlesnake events had to be canceled. 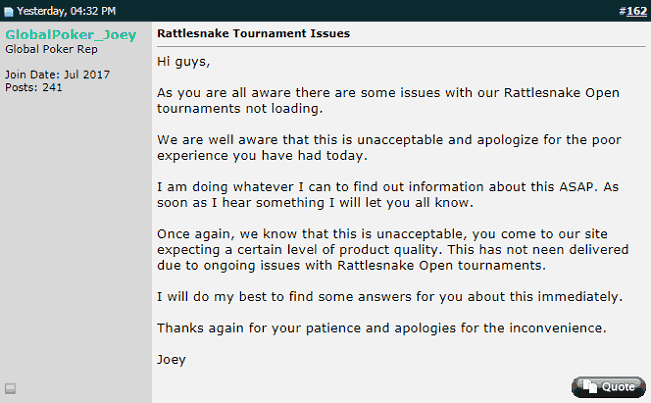 Some were unable to register for any tournament. Others were able to join tourneys but then were unable to open up the lobbies for their games. There were even a few players who were seeing a bunch of old lobbies pop up from previously completed games that had long since ended. Unfortunately, this response was a bit light on details while being heavy on vagueness. There was no indication as to whether or not the games would proceed as normal, would be canceled and refunded, or would be paused until further notice. Many posters on Twoplustwo expressed dismay at the fact that they didn't know whether they should wait by their computers or close down Global Poker and find something else to do. Throughout all these tournament snafus, $weeps Cash ring games were operating without a hitch. However, at about 5:30 p.m., the site's servers were restarted, and everyone was disconnected. When users were able to log back on a few minutes later, cash game players reported that all the $weeps they had at the tables was missing from their account balances! Also, after the short downtime, all the affected MTTs had been removed from the lobby. Finally, after more than three hours of uncertainty, players were free to go about their lives without worrying about being absent while possibly having live tournament entries. The “normal refund policy” referred to in this post involves first paying back all remaining contestants their tournament fees. Then, the prize pool is distributed 50% evenly to all remaining players and the other 50% divided up based on chip count. We haven't been able to find solid numbers on how much the room will have to eat in overlays for the L and M Main Events. Anecdotal reports suggest that it may be as much as $9,000 in the L and $30,000 in the M.
We're glad that Global Poker is doing the right thing in paying out the entire prize pool for the canceled events, including the overlays. It's also heartening to see that the room is aware of the missing cash game funds and is working to restore users' balances to what they should be. Nevertheless, we feel that this organization dropped the ball when it comes to technical competence and customer support. 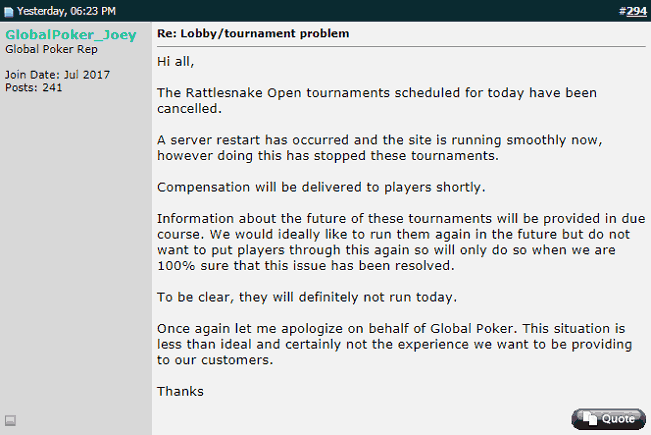 Unfortunately, the moneys promised by Global to players in the Rattlesnake Main Events have not been returned without incident. On Wednesday, May 23, “GlobalPoker_Joey” posted a breakdown of the refunds issued, and he used a different formula from the payout policy referenced earlier. Joey's math involved paying back a total of $19,894 to players in the L Main Event, which was $4,894 more than the guarantee. However, the M Main Event, with a guarantee of $40,000, only credited remaining players with a total of $25,660: nearly $15K short of the guaranteed amount. Joey said that this extra money was paid out to people active in satellites to the event at the time of disconnection. However, this would imply 130 x $110 awards to satelliters. This seems unlikely given that the number of people who entered the M to begin with was just 129. In any event, there was no mention made earlier about reimbursing satellite contestants with overlay money; this was a totally new wrinkle added by Global Poker to the equation. Several posters on Twoplustwo have gone over the math, and they contend that the cash actually placed in users' accounts doesn't follow the outline specified by Joey. They feel that Global is just straight-up keeping some of the funds for themselves. Moreover, the refunds for cash game players who lost all the $weeps they had at the tables have been marred with delays and inconsistencies. All in all, this is a poor showing by Global. If the room wishes to avoid becoming a laughingstock, it will have to really step up to the plate and make everything right with its customers in a forthright and honest way. Customers have already been waiting for four days without a satisfying resolution to this situation. Given that similar gameplay interruptions had occurred the day before and that May 20 marked the culmination of a major MTT series, we feel that Global's IT department should have been closely monitoring the games and working to resolve any errors. The fact that tables were unplayable for hours at a time means that someone wasn't doing his or her job. We're not sure exactly what went wrong at Global. “GlobalPoker_Joey” at one point said “that something is running over and over again that shouldn't,” but this is a pretty uninformative explanation although it does hint at some kind of recursive process gone haywire. Could it be that Global has suffered a DDoS attack, the likes of which we've seen at many online poker organizations over the years? Regardless of the root causes of the service interruptions, failing to keep customers updated as to what was going on is inexcusable. Many had set aside the entire day to enjoy the Global Poker tournaments, and they then were left hanging for an extended period of time while the site attempted to figure out what was happening. Whether you're fed up altogether with Global or are willing to put up with their occasional mess-ups, it can't hurt to explore your other options for online poker. Global players in the United States may wish to consult our page covering online poker for Americans. Our friends to the north can instead read through our Canadian online poker guide.